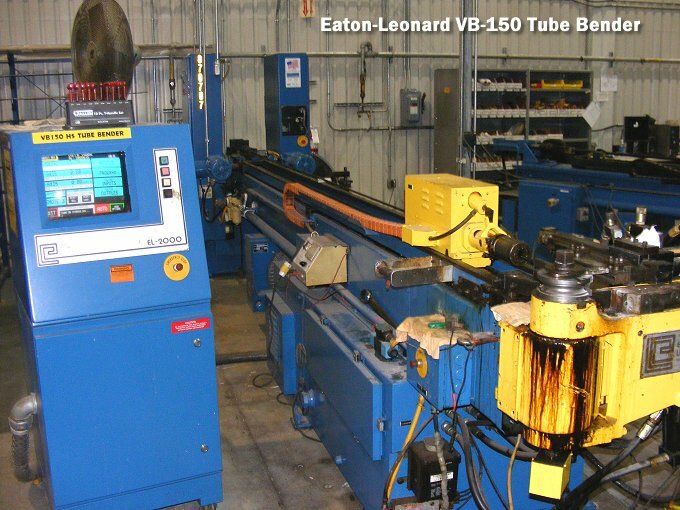 For sale used Eaton -Leonard VB-75 and VB 150 CNC controlled Tube Bender, which was installed new in 1986. Learn why a Plant Machinery buyer's agent can guide you through the Used Equipment purchasing maze. Techmachinery.com used plant productions machinery listings. Think of us as a machinery listing service for both buyers and sellers of machinery. 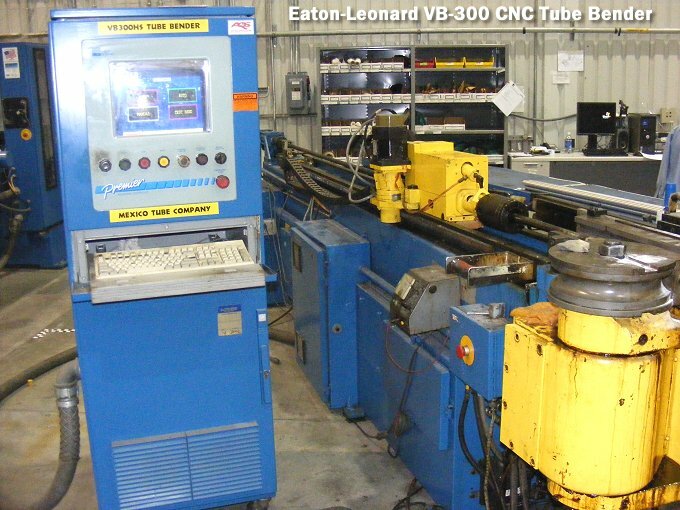 1 USED -VB150 Eaton-Leonard CNC 1.5" Capacity Tube Bender for sale at liquidatiuon pricing. Eaton Leonard's VB150 combines the latest technology and features for maximum productivity, part quality, reliability and fast set-up for tube bending up to 1.5" diameters. Typical applications include automotive exhaust tubes, structural components and high strength aircraft tubing. The VB-150 HP uses a heavy-duty, high torque servomotor to power its high-capacity bend arm. The entire bend arm and head assembly incorporates high load-carrying components engineered for superior reliability. Key standard features are incorporated on this used VB-150. Linear roller bearings with automatic lubrication are used on the pressure die, follower slide and centerline radius adjustment. A high-performance rack and pinion servomotor-driven carriage offers exceptional accuracy and repeatability. Quick-change single-piece collets provide fast tooling changeovers. Call for liquidation pricing. 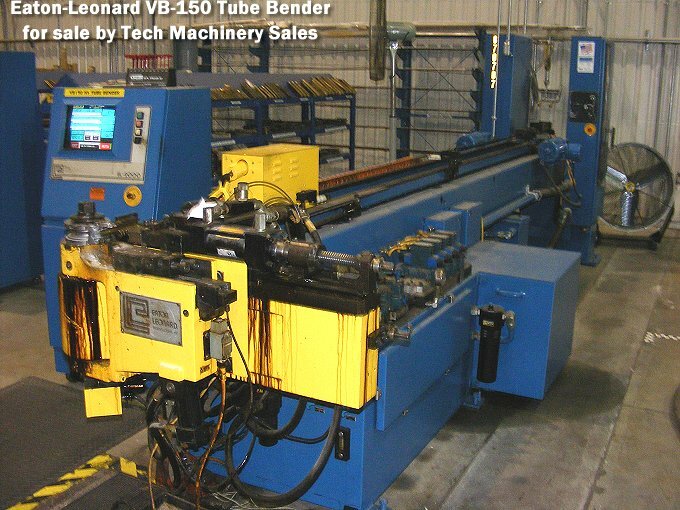 1 USED -VB300 Eaton-Leonard CNC 3" Capacity Tube Bender system now offered for sale by Tech Machinery Sales. Capable of bending tubes up to 60 mm( 3") diameter and more, the VB-300 HP sets new standards in part shape clearance and flexibility. This unique design uses a compact, low-interference bend head to produce intricate parts with ease. VB 300 HP incorporates a robust, compact bend arm and head assembly to accommodate such complex shapes seen in furniture components, automotive parts and aircraft tubes. Call Techmachinery for further machine details like a servo driven, heavy-duty carriage with patented quick-change collets that require no special tools or fasteners. Machine programming and monitoring are easily accomplished through the Premier Plus touch CNC screen interface. This operator friendly system incorporates a PC-based processor and commercially available I/O devices. Premier Plus incorporates a 15" high-resolution active matrix flat panel display and separate keyboard for easy programming. Interface to Eaton Leonard's Vector 1 tube data center is standard, providing closed-loop inspection, bender data correction and storage. 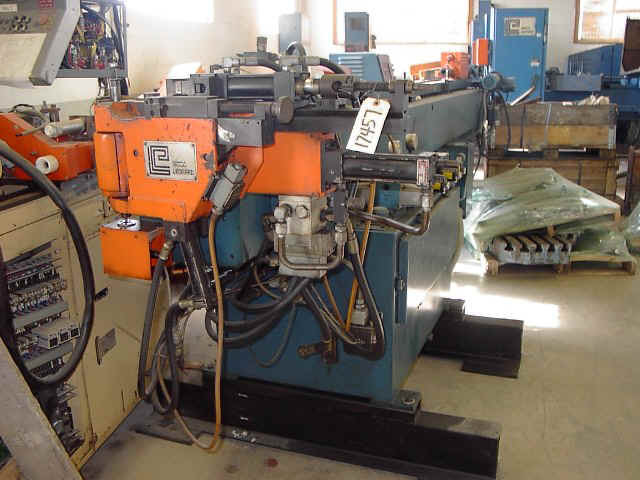 Tech Machinery Sales also has the below used Eaton-Leonard VB-75 CNC controlled Tube Bender (new in 1986. ) for sale. 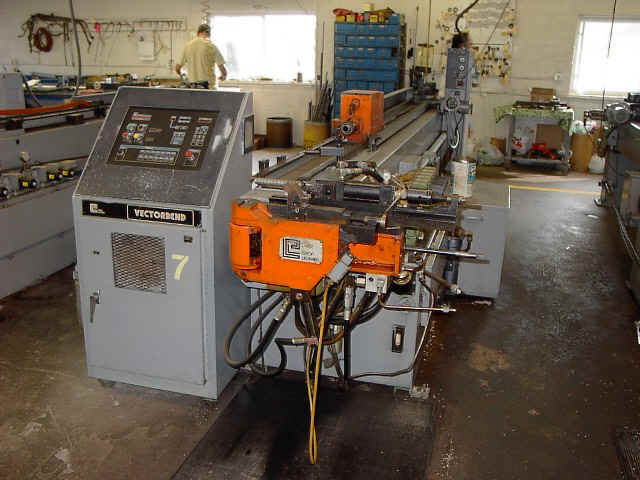 Additional Eaton-Leonard and other brand CNC machinery, Brake shears and Hydraulic presses are available for purchase from Tech Machinery's Metro Detroit warehouse at liquidation prices..
Other Used CNC Benders are available. Call Tech Machinery at (586) 773-8822 or e-mail us for pricing and complete details on these plant production system bargains. We have access to thousands of machines. Because of our computerized inventory and communication system, daily contact with manufacturing plants and process facilities, and Internet hook-up; we are better able to sell your surplus machinery and to locate machines that you need. We are always looking for quality surplus machinery equipment. 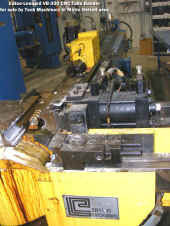 Presses, grinders, thread rollers, plant production lines to name a few. 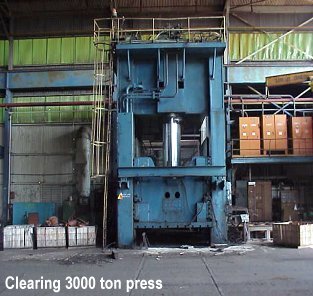 Everything from a single machine to an entire plant are sought after by our used machinery clients..
Rare 1971 Clearing 3000 ton stamping press in great condition for sale at liquidation price. Call Tech Machinery for pricing and further Clearing press details. 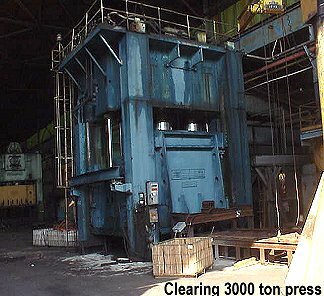 We now have in stock three rare 5000 ton Hydraulic 4-post presses available for immediate sale. 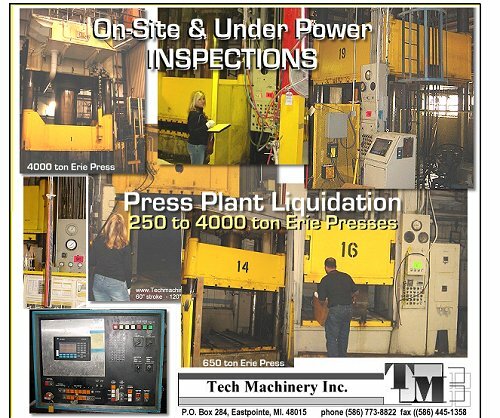 Tech machinery also has 40+ ERIE, HOESCH, Williams and White 4 post hydraulic presses ranging from 400 tons to 2500 tons immediately available for 2 plant liquidation sales. Call Tech Machinery at (586) 773-8822 or e-mail us for pricing and complete details on these plant production system bargains. Opt-in to receive our most current used machinery for-sale listings! groups membership or send a "Want to Buy" message to members and our Buyers. 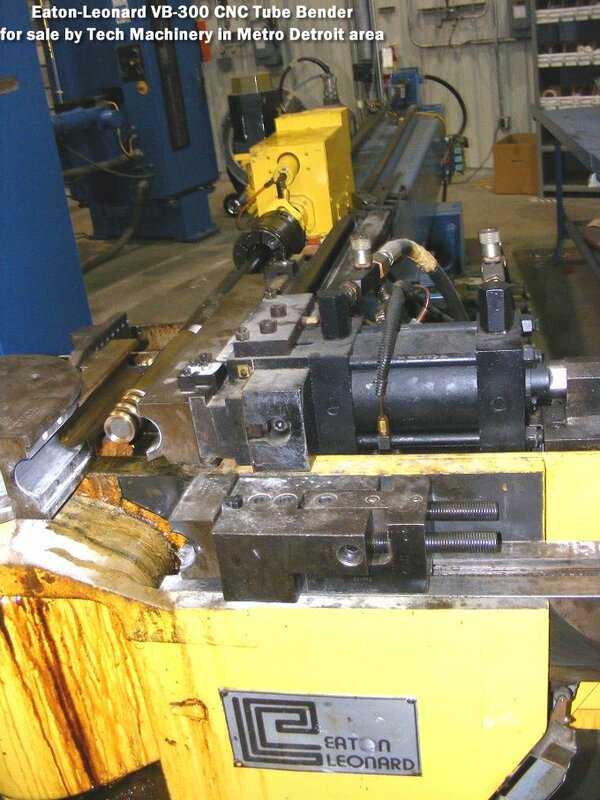 New offering: USED 2000 Ton Williams & White Hydraulic Press with 72" Stroke - 100" Daylite - 120" x 96" Platen and all controllers and safety equipment... call for liquidation price on this and the Ficep Screw Press shown below. Rare offering in a used screw press... 2500 Ton Ficep Screw Press with 400mm diameter Screw capacity. This one is outfitted with hydraulic upper and lower ejectors and has optional die heater unit. FICEP SPA designs, manufactures and sells worldwide CNC controlled machines & systems for the steel construction and forging industries. It's a Buyer's Marketplace in the used plant production equipment marketplace in the USA. Tech Machinery Sales is your advocate for getting the lowest price on excess machinery due to bankruptcy or distressed sales of viable production equipment. The Global economy is being fueled by putting this production machinery back into use in USA growth areas and worldwide industrial cities.